Last year some Melochia pyramidata popped up in my yard all on its own. I was able to gather some (really neat looking) seed pods once they had dried out. I'm moving pretty soon and I'd like to grow this plant from seed at my new place. Any idea what is required to germinate these seeds? When should I plant them? I'm pretty new to all of this and I haven't been able to find any info on the internet for this particular plant. Melochia pyramidata is called broom-wood and is an annual plant that is native to Florida, Louisiana and Texas. It blooms from August to October. The encyclopedia of life has some good closeup pictures of the seed pods if you want to have a comparison. The species is named for the pyramid-like fruit. It’s worth trying to germinate your Melochia pyramidata seed. Try a few in the late winter outdoors in a sunny spot in your new garden and see if they germinate shortly thereafter. You may want to also soak the seeds in water for 24 hours and then sow them in pots in the early spring. Transplant them into the garden once they are big enough to withstand the elements. Good luck in your new home and garden. 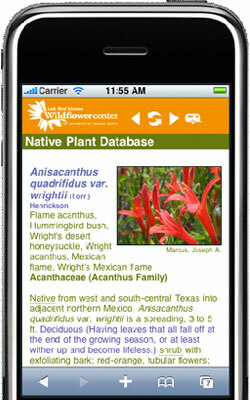 If you would like some more information about saving native plant seeds, visit the Lady Bird Johnson Wildflower Centre. April 25, 2014 - I have been able to grow several Lupinus havardii (Big Bend Bluebonnet) and they are now making seed. Is there anyway to determine if a seed is good or bad for this plant?